Lowell Davis is one of the premier craftsmen of our time. His unique farm-life figurines have graced shops and homes around the world and have been featured in The Saturday Evening Post, Country Living, and Collector’s Mart. This famed painter and sculptor now turns his craft to the page in his captivating work, The Book on Chickens, sure to be of interest to collectors and newcomers alike. 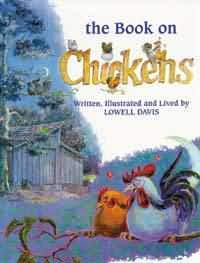 Davis’s familiar character-collectibles, Big Jack and Goldie, come to life in this enchanting, full-color story of two chickens in love. The clever, superbly-illustrated story takes us through the courtship, marriage, and parenthood of a loving couple holding firmly to their traditional values. The story takes place on a farm in Southwest Missouri, “far from the big cities, snuggled in the foothills of the Ozark Mountains,” similar to the one where the author lives. Lowell Davis left the city more than fifteen years ago to build a 1930s-era farm in the foothills of the Ozark mountains. Changing from advertising art director to homespun whittler, painter, and sculptor, Davis escaped to begin his rustic life in Carthage, Missouri. An inductee into the Agricultural Hall of Fame and noted speaker on limited edition collectibles, Lowell Davis continues his artistic trade of designing, sculpting, and painting for Schmid of Randolph, Massachusetts and Border Fine Arts Studio in Scotland.